Very few things in life can prepare one for the rigors of law school. 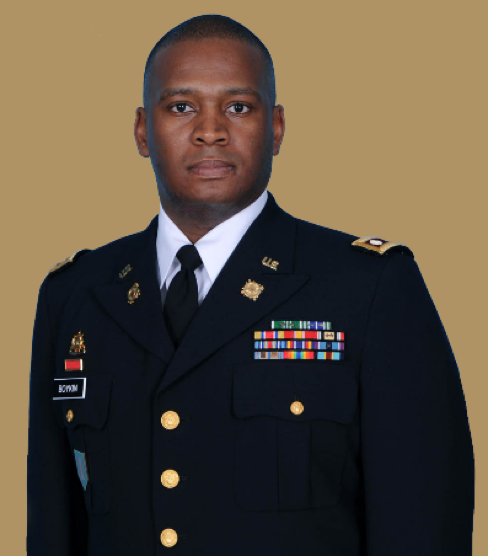 Serving on the battlefields of Iraq in 2004-2005 and a second deployment to Kuwait in 2010-2011are defining events that Lieutenant Colonel Michael A. Boykin, 4LE, says helped him deal with the many challenges of law school. Mr. Boykin balanced working full-time at UNC Chapel Hill as a Business Systems Analyst, serving in the US Army Reserves, being a husband, and pursuing a law degree as an evening student by treating each semester and each year as part of an overall “operation.” Just as he had planned numerous military operations throughout his 29-year military career, he applied that same logic to law school. Mr. Boykin applies the following steps to most endeavors he is involved with: 1) determine the desired outcome, 2) develop steps to meet your goals, and 3) continually assess where you are. He says, “Sometimes you might fall short of the objective, but having a plan and making adjustments along the way are important to meeting one’s goals.” Boykin's spirituality has been and continues to be a large part of his life and guiding force in all his endeavors and the support of his lovely wife, Sherri Jackson Boykin. What made you want to attend NCCU School of Law? When I attended North Carolina State University, I graduated with a Bachelor of Arts in Political Science, with a concentration in Criminal Justice. It was my intention to attend law school upon graduation, but as life would happen, I started working and before I knew it, several decades had passed, but the desire to attend law school never diminished. I chose NCCU School of Law because of the evening program. I knew that I had to continue working, so the evening program was perfect for my schedule. It was very tough to get into the evening program. It has been an incredible four years and I am definitely glad I had the opportunity to attend NCCU. What has been your most rewarding experience in law school? I have absolutely enjoyed being involved in as many law school activities as possible, but being elected class representative all four years has been the most rewarding experience. As a non-traditional law student, I was 43 years old when I started law school. I wanted to do more than just go to work, go to school, go home, and repeat that cycle for four years. Therefore, I signed up to be class representative my first year. I figured that would ensure that I interacted with Student Bar Association leaders and law school administration. Helping connect my class members with things that were going on with the school and other organizations was very important and it was needed. I became an advocate and voice for the Evening Class of 2018. I have enjoyed it and my classmates continued to support me in that capacity. What advice would you give current and future law students? See it through! Law school is tough and you really, really have to be committed and prepared for the unexpected challenges and difficulties of life AND law school. Things happen that will require you to handle difficult situations, even when you have to study for the toughest exam of your semester. Preparation, determination, and commitment are the qualities students must have and continually improve upon in order to get through this enormous hurdle, known as law school. Find a couple of classmates who keep you motivated and you will in turn become their motivation. Enjoy the grinding pace of law school, stay focused, and remember, if law school were easy, then anyone would be able to do it! It takes a special and dedicated person to graduate law school. How have your military service and law school experiences intersected? Prior to attending law school, I had been able to juggle my studies and the military as an undergraduate, as a graduate student, and as a full-time employee. I knew law school would be super demanding, so I applied the same dedication in my previous educational pursuits to law school. While on weekend reserve duty, I always took my law books and assignments. Whenever I had a chance to pull out the books, I always did so. I was also fortunate enough to have superiors that supported my personal and professional growth. I think the military has made me a better student and I can certainly see how law school has made me a better military leader. Law school has increased my ability to analyze situations more quickly and get to core issues while excluding information that really does not pertain to the situation. I use that same skill set in my civilian profession as a Business Systems Analyst at UNC Chapel Hill. The critical thinking skills that I have acquired in law school have been immensely helpful in my professional and civilian life. How will the military influence your law career going forward? As a veteran and current Army reservist that suffers from combat-related Post Traumatic Stress Disorder (PTSD), I plan to use my military knowledge and legal education to help other veterans deal with veteran disability claims. Unfortunately, there are thousands of veterans who are eligible for military disability benefits, but they lack the skill and ability to navigate the bureaucracy associated with the Veterans Administration. I plan to help as many veterans as I can with the disability process. What is your plan after graduation? How you plan to use your degree? I have been giving this question a lot of thought now that graduation is near. I am very fortunate to have quite a few options once I graduate and pass the North Carolina bar exam. After my first year of law school, I decided that I wanted to pursue the Juris Doctor/Master’s in Library Science (MLS) joint degree. I already had an MBA, so I wanted to diversify my educational background. I felt the library science degree would enhance my legal research skills and provide career options in case I wanted to become a law librarian. I finished the library science courses for the joint degree in 18 months and earned a 4.0 GPA in the MLS. I could become a law librarian if the opportunity presents itself. I also have a background in human resources with approximately 20 years in corporate environments and within the North Carolina university system. As I focus on my human resources career, I ultimately would like to become a Vice Chancellor for Human Resources at a college or university or a Vice President for Human Resources in the corporate world. Those positions are the senior positions that have the responsibility of shaping and enforcing fairness and equity in the workplace. I think my law degree, various military assignments and experiences, and various HR positions are all factors that serve as a solid foundation for those positions. No matter how advanced our world becomes, people will always be essential to businesses, to universities, and every other aspect of life. We will always need leaders who can motivate people, protect their individual and collective interests, and accomplish the goals of the various businesses. Those are all things that I have a vast amount of experience with and those are areas which I can use my law degree and have the most impact.